Is Buffalo The Best Team In The NHL? The Buffalo Sabres came very close to knocking off the eventual Stanley Cup champion Carolina Hurricanes in the semi-finals last season. They probably would have were it not for a very injured defence. They started off this season with a winning streak that tied the record for consecutive wins at the beginning of a season (with 10). Therefore many people are rating them the best tream in the NHL (for example the TSN power rankings). These kinds of rankings cannot be taken too seriously, because it is fairly routine that a team goes on a three game losing streak and suddenly drops 10-15 points. Isn't that a huge overreaction to a minor speedbump? In an effort to better quantify the power ranking process, David Johnson's Hockey Analysis has a system that uses the record to date (adjusted to call any game that goes to a shootout a tie and subtracts any overtime loss points) and adjusts it for the strength of schedule that teams have played against (which in the days of the unbalanced schedule can vary widely). The first thing that David noticed is that three of buffalo's wins came in shootouts. Prior to the lockout, their record would have been 7-0-3 in their first 10 games and not 10-0. Its not accurate to say that the "record" they tied is as big as achievement as that of the 1993 Toronto Maple Leafs who went 10-0 without shootouts (but did not win the Stanley Cup). The shootout makes Buffalo's record look better than it is. When we look even deeper, we see that Buffalo faced a pretty low level of competition. They played teams off to very weak starts like Philadelphia, Boston and the NY Islanders and Rangers. In fact Buffalo faced the fourth worst quality of opposition by Johnson's rankings (as of October 25th). Once again, I will conclude that some pundits are overrating Buffalo. They are not as good as a first glance at their record might indicate. Buffalo is not the best team in the NHL. In fact, Johnson rates them 12th. His rankings have San Jose as the best team in the NHL. However, in the era of enforced parity it is probably most correct to say that no one team is the best in the NHL. The difference between the 1st and 12th place teams is small. A slump or an injury could change their order. A couple slumps and injuries and the best teams are missing the playoffs. Is this a good thing? Most of the league has a chance at being in first place and winning the cup, but nobody is truly great. As a fan we lose out on the chance to see truly great teams because all the teams are not too far removed from average. I am a member of a very deep fantasy hockey league. Our website is here. We have an immediate opening for the Detroit Red Wings franchise. The league is a 30 team keeper league with 25-27 man rosters. We have been in existence since 1999. Occassionally I have posted our draft results. If you are interested in this team, please email me through my profile. Its never a good thing to burn out your defence by overplaying them in the regular season and having nothing left for the stretch run and the playoffs (if you get there). Last season, Vancouver was guilty of this in the early season. They gave an awful lot of playing time to Ed Jovanovski, Mattias Ohlund and Sami Salo. That big three on defence was unable to keep up that pace all season and after the Olympic break all three were injured. Vancouver limped through the rest of the season and missed the playoffs. So far this season, the team that most seems to be following that pattern is the Anaheim Ducks. They have Scott Niedermayer, Chris Pronger and Francois Beauchemin all in the top fifteen players in ice time per game in the NHL. Thats unsustainable for the whole season. Sure Niedermayer and Pronger are hall of fame talents, but that will not prevent them from suffering if they are overworked. If Anaheim's other defencemen Joe DiPenta, Shane O'Brien and Sean O'Donnell cannot share more of the load, Anaheim will have to acquire somebody else to do so, or else I doubt this defence will be healthy enough to dominate games as it must for Anaheim to have a serious shot at the Stanley Cup. Its still extremely early in the season, but that won't stop me from trying to identify the best players so far in the year (for example I pick Nicklas Lidstrom as the best defenceman so far). Today, I want to look at goalies. I think the best so far is the often overlooked star in Minnesota Manny Fernandez. A man who has put up a few very good seasons in a row (enough that his name should start to enter conversations about elite NHL goalies). So far this year, he has a .945 saves percentage, 1.60 GAA and a 6-1 record. All are impressive numbers with the rising Minnesota Wild. Its pretty clear that the best team so far this year has been the Buffalo Sabres. They have a 9-0 record (which is more correctly an impressive 6-0-3). They have really been impressive in their last few starts (moreso than their first starts where they were not dominant and relied upon the shootout. Perhaps the most impressive thing we have seen so far is Buffalo's offence (which leads the league) and is led by Maxim Afinogenov and Tomas Vanek (who are currently the two players in the top 10 scorers with the least shifts per game). Could they score even more with more ice time? Wouldn't that be impressive? Is Buffalo really the best team in the NHL? Will they win the Stanley Cup? I am quite doubtful. No team is actually as good as they look at their peak and no team is actually as bad as they look at their worst (thats good news Philly). Buffalo looks great in October. October is a long way from playoff time. This start will be a distant memory by then. One thing I enjoy is watching the first few games and picking out the unexpected players who play like superstars. Its always suprising when a Martin Havlat or a Maxim Afinogenov leads the NHL in points. However, this pick is not a suprising early season leader. The best defenceman so far this year has been Nicklas Lidstrom. He has seven points in his 8 games and has been logging over 24 minutes per game. His game is right where he left it last year when he won the Norris Trophy. Perhaps a more interesting question than is Lidstrom the best defender in hockey today (of course he is) is how far up the list of the best all time defencemen has Lidstrom climbed so far? Its still very early in the season, but one suprise is the Philadelphia Flyers are in last place. Some (including me) picked them to win the Atlantic Division. Its true they had a bad stretch, but I still would expect things to turn around soon. The team has too many good players to be this bad. Instead of being patient, the Flyers made some desperate bad moves. Ken Hitchcock is one of the best coaches in hockey. They fired him. Bobby Clarke is a great GM when it comes to finding talent (and not quite so great when it comes to interpersonal skills). They had him resign. Paul Holmgren takes over as GM. John Stevens takes over as coach. Bopth look like backward steps for the franchise. You should keep a coach or GM if they are better than their available replacements. I'm sure when all is said and done, the Flyers will finish much better than their current standing but its not due to these moves. Its because they were not as bad a team as they looked over the first couple weeks of a long season. Here is TSN's story on these Flyer moves. With a two point night last night against Boston, Maxim Afinogenov of the Buffalo Sabres takes over the scoring lead in the NHL with 14 points. His lead is somewhat safe in the short term because the previous leader Martin Havlat hurt his ankle last night and is expected to be out 2-3 weeks. Nobody else is withing 3 points of Afinogenov. Afinogenov is likely a short term early season point leader, in that he likely won't win the Art Ross trophy, though he was a highly regarded prospect who took a few years to mature but showed signs he might develop into a star last season. This could be a breakout year for Afinogenov, but I would be suprised to see him win the scoring title. 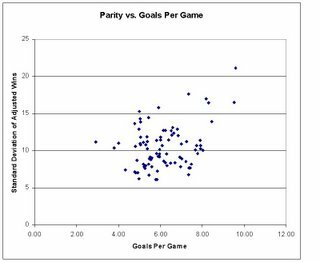 Does Parity Correlate With Scoring Rate? I don't think the overall level of talent makes much difference to the scoring rates. I think the distribution of talent makes a very large difference. The more parity, the less scoring. I don't think that helps you on this particular quest but it seems to me that if this is so, it should be provable. So I set out to prove or disprove this theory. By parity I will use the standard deviation of wins among the teams in the NHL that season. The higher the parity, the lower the standard deviation of wins. Since the length of NHL seasons has changed significantly over the years it is necessary to adjust this number for the schedule length. In fact, I am using the numbers that Pnep (Roman Nepomnyaschev offered in the comments in the Why We Need A Quality of Opposition Adjustment To Rank All Time Goal Scoring Seasons thread. 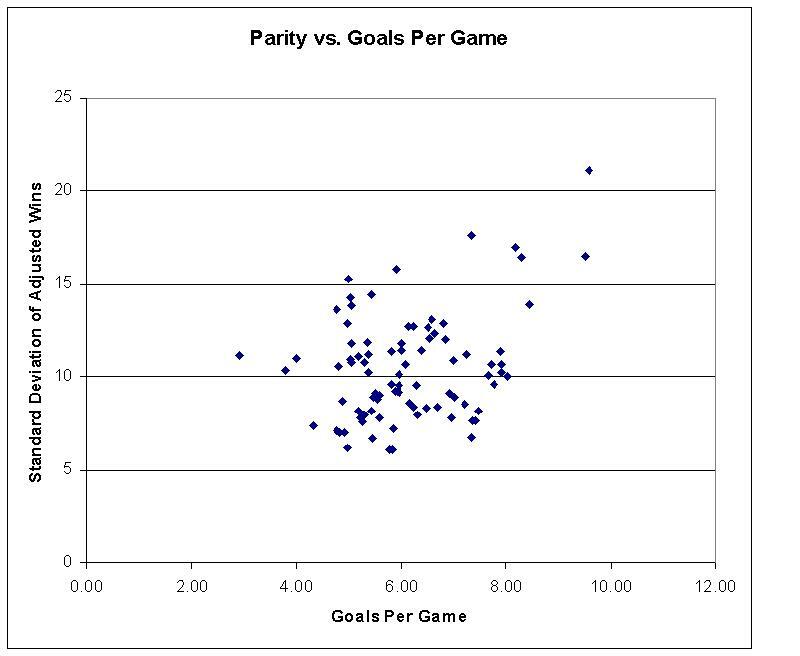 We can calculate the correlation between the parity and the goals per game. If they fit perfectly on a line with increasing slope (as this parity value increases so too does goals per game) we will get a value of one. If they fit perfectly on a line with decreasing slope (as this parity value decreases, goals per games goes up)we will get a value of -1. If there is no dependence of this partiy value with goals per game, we will get a value of zero. The correlation in this case is 0.33. So it would appear that as parity is decreased (standard deviation of adjusted wins increases in this case) then goals per game go up. This is consistent with Tom Benjamin's prediction. However, there is an important statement often made in statistics. Correlation does not equal causation. This is an example of why this important disclaimer is often given. 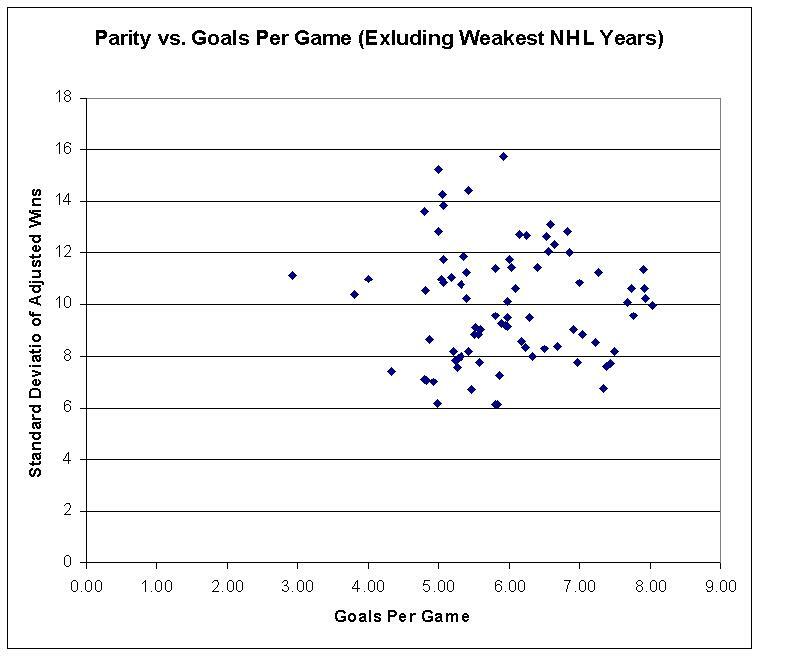 If we look at the plot, the increasing slope of parity vs. goals per game is almost completely determined by five points. These are the five points in the upper right of the graph. These are points with both a high standard deviation of adjusted wins and a high goals per game. Lets look further at these points. They come from the 1917/18, 1918/19, 1919/20, 1943/44 and 1944/45 seasons. These are the first three seasons in NHL history and the two seasons where the NHL talent pool was greatly depleted because of World War II. These are probably the seasons where the quality of play was the lowest. This correlation seems to be entirely driven by these five seasons. What happens if we remove them and repeat this calculation? Now the correlation between the parity statistic and goals per game is gone. In fact the correlation is calculated to be -0.03. Effectively there is no correlation. 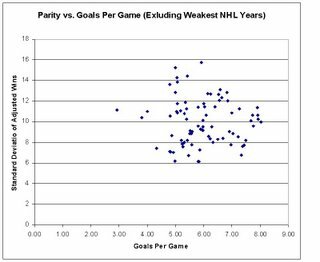 There is an apparent correlation between parity and scoring rates in the NHL if we plot all of the seasons the NHL has existed. 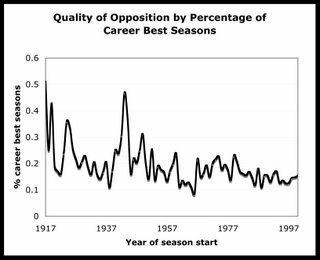 That correlation is entirely driven by the five seasons where the NHL was weakest (its first three years and the two years at the end of World War 2). This is because scoring rates do correlate with the quality of play in the NHL. When there is a low quality of play scoring goes up. It happens that when there was this low quality of play there also was very low parity and that creates an apparent correlation. When we remove these seasons. we see no correlation. This means that the decrease in scoring over the last decade or so in the NHL is NOT driven by an increase in parity in the NHL. However, it is likely driven (at least in part) by the increase in the level of talent in the NHL. This summer Charles Wang and the New York Islanders hit the news when they signed Rick DiPietro to a 15 year $87.5 million contract. This ill-advised move came after they hired then fired GM Neil Smith after a tenure of 40 days and zero games (and replaced him with a backup goalie). Wang is determined to run the Islanders his way, regardless of how crazy his way might be and regardless of how many people tell him its not a good idea. So how is it working? Its only a few games into Rick DiPietro's record length contract, but it doesn't look good in the shortterm. So far this year, DiPietro has a lacklustre 0-3 record with a poor 4.53 GAA and a .879 saves percentage. These aren't numbers worthy of a high profile contract like the one he signed. Mike Dunham was brought in at far less cost ($500,000 over one year) and so far this year has been the better of the two goalies. Dunham has appeared in five games. He has 2 wins, 2 overtime losses and one no decision. He has a very good .939 saves percentage and a 2.21 GAA. Arguably, Dunham has been the best Islander player so far this season. If I was coaching on Long Island, I would make Dunham my number one goalie as long as he can play this well. I wonder is Charles Wang would allow this or would the owner interfere with day-to-day operations of the franchise by forcing them to play his chosen goalie even if he isn't playing particularly well. Last year, the Ottawa Senators had the number one offence in the NHL. They scored a league leading 314 goals. Two of the top five scorers in the NHL were Sens (Dany Heatley and Daniel Alfredsson). So far this season things have changed. They have the NHL worst offence with only 9 goals in their 5 games so far. To add insult to injury, former Sen Matin Havlat leads the NHL with 13 points. That means he has been in on more goals by himself then the entire Senator team has. So what is the problem? The Sens still have a talented group of forwards led by Alfredsson, Heatley and Jason Spezza. Since last year Martin Havlat was limited to 18 games due to injury, his loss cannot be a reason. They played without him most of last season. I think this is a problem that will osrt itself out. Ottawa has too many talented offensive players to not score. Evcery team has a slump at some point in the season. Its Ottawa's poor luck that it comes right at the beginning where it is much more obvious and thus appears more serious. One dubious distinction I like to keep track of is the worst player in the NHL who is still getting playing time. Last year I gave that "honor" to Steven Goertzen of the Columbus Blue Jackets a man who put up zero points with a -17 +/- rating in 39 games at right wing. This upset an F.D. Goertzen (a relative?) who made a defensive comment. Goertzen is back in the AHL this year where he better belongs (his 10 points in 32 games there last year were not too impressive). Goertzen was supposed to be an "energy guy" but whenever I watched Columbus, he just looked hopelessly overmatched. In general, the player who is playing the worst with a regular shift is a name player having a horrible year. Rarely does a Stephen Goertzen get as long a look as he got last year without some production. So far this year, the worst player has bewen Petr Nedved of the Philadelphia Flyers. He is off to an awful start. After a horrid game where Buffalo beat his Flyers 9-1 he now is a -7 with no points in 6 games. Nedved is too good a player to play this badly. He is a streaky scorer who is often defensively disinterested. That can lead to stretches like this one where he really looks awful and is not worth a spot in the NHL. Petr Nedved has not impressed Flyer management who have waived him today. They claim they intend to send him to the minors. Given that he is 34 years old, if he spends the rest of the season in the AHL it could be the end of the line for him. Here is TSN's story about Nedved's waiving. Since Alexei Mikhnov joined the Edmonton Oilers and Andrei Taratukhin joined Calgary leaving their Yaroslavl contracts in Russia by giving two weeks notice a practise which has been found by Russian court to not be valid in pro sports, their Yaroslavl team is suing to prevent these players from playing in North America. This problem exists because no Russian-NHL IIHF transfer agreement exists to govern player movement between the leagues. It is expected that Metallurg Magnetogorsk will follow suit with a similar lawsuit regarding Evgeni Malkin of the Pittsburgh Penguins. These Russian teams don't really want or expect to have the players returned to them. They expect to receive some form of financial compensation for their loss. They are unhappy that the potential transfer deals are for far too low financial amounts and won't sign them. They are looking for courts to set a higher number or to negotiate an out-of-court settlement for more money. Something needs to be done to end the cold war between the NHL and the Russian leagues. In the end, the Russians will get more money for player transfers or the flow of players from Russia will be fuirther reduced. This is a significant issue that will change the nature of internation hockey relations. Here is TSN's story on this legal action. NOTE: The next day, Magnetogorsk has followed suit by suing the Pittsburgh Penguins over Evgeni Malkin. Here is TSN's story about the further lawsuit. Last year, the Buffalo Sabres came within one game of a trip to the Stanley Cup finals. This came after the team took a big leap forward making the playoffs for the first time since 2001. It has become a somewhat fashionable statement to claim they are the best team in the NHL since they are off to a 5-0 start this season. In fact, there is even an hfboards thread asking if the Sabres are the best team in hockey. Now I picked the Sabres to a respectable seventh in the East Division but hardly in a position that is worthy of "the best team in hockey". In fact of the predictions Jes Golbez gathered I pick the Sabres to have the worst finish of all nine pundits. Last year, the Sabres made a big step forward. They did it with depth. They did it with everyone contributing well. And they did it without superstars. In fact the Hockey News top 50 players list does not include a single Sabre. This is the kind of team that finds it hard to repeat. This is the kind of team that often regresses to the mean. This is one of the most fundamental results in sabremetric analysis. So I boldly ignore the popular opinion and predict Buffalo will regress to the mean. They still don't have any superstar forwards (Daniel Briere is pretty good but he's a step below superstar). Their defence might be an achilles heel as it will have to be without Jay McKee and Teppo Numminen is still holding on despite some heart problems. Ryan Miller might be a superstar goalie, but he is making his jump to NHL regular at an awfully late age (he's 26) and this generally means he won't continue to progress much as he is already approaching his years of peak performance. I predict Buffalo will be a good team, but they won't be able to repeat at the level they did last year. Now this season they are 5-0 am I wrong? They may have a perfect record, but I am still not impressed. Three of their five wins were shootout wins. That means the games were very close. Even if Buffalo is an unbeatable team in shootouts (something I doubt based on their 2-7 result in shootouts in 2005/06, that is too many close games and it will catch up to them. In regulation, Buffalo has scored 19 goals and allowed 15. This gives them a Pythagorean winning percentage of .616 which is good, but its not the best in the NHL. In fact it is nineth. Atlanta, Dallas, Detroit, Edmonton, Minnesota, New Jersey and San Jose all have better pythagorean winning percentages (goals for ^2 / (goals for ^2 + goals against ^2))right now. Theoretically, they should project to nineth place. That is no place for the team being crowned "best in the NHL". Early last season, many of the pundits picked Ottawa as the best team in the NHL. I believe that had Dominik Hasek stayed healthy and continued his Vezina level goaltending he was showing before injury they would have shown that, but in the end they didn't come very close to the Stanley Cup. NOTE: Several hours after I posted this, Buffalo defeated the Philadelphia Flyers 9-1. This certainly is a dominant win that I had been looking for. Whether this more clearly shows the problems in Philly or the strength of the Sabres is another question. Its far too early in the season to start making serious award predictions, but the MVP so far this year is Martin Havlat of the Chicago Blackhawks. In four games played he has 10 points (which leads the league), six goals (which is tied for league lead) and has a +7 +/- rating (which is also tied for the league lead). Many other teams have one more game than Chicago so that makes his league leading figures that much more spectacular. I had wondered how Havlat would fit into Chicago. Would he be lost without the first class linemates he enjoyed in Ottawa? So far he hasn't missed a beat. In fact, he has probably done better without them. Will he be able to keep it up all season? If so, Chicago might be a surprise playoff team. In several sabermetrics and hockey posts I wrote over the summer that were looking at adjusted scoring from different eras using the normalization methods of the hockey outsider (Peter Albert) one consistent problem came up. 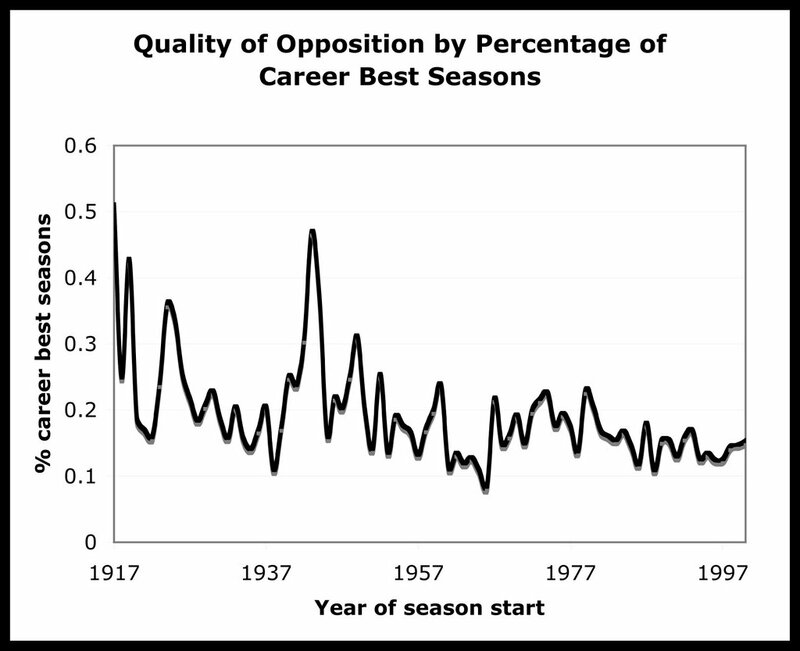 That of adjusting statistics for the quality of opposition in the league. This problem is clear when looking at the single season adjusted goal scoring leaders where nobody from the original six era makes the list and from looking at the career adjusted goal scoring leaders where the order of the top players depends on how we score seasons in the WHA. The problem of quality of opposition is highlighted by looking at inferior professional leagues like the WHA. I was planning to look at several different potential methods that do not work. One could use the scoring rate, average age of players, standard deviation of player ages or the competitive balance in the league as proxies for quality of opposition. None of them work well. In general, the scoring rate decreases when there is more talent in the league. The best players do not have as many weak opponents to score a lot of goals against. This is a simple reason why the NHL has had troubles keeping scoring up. That said, there are exceptions to the rule - most recently the increase in scoring in the league came from a raise in power play time. In fact, there are several examples over the years of rule changes affecting scoring rates. This observation that better hockey tends to be lower scoring on average does not hold up well during the 1980's when the Edmonton Oilers dominated the league. When the average age of players is younger, in general the NHL is a better league. This is true in the recent past. When more older players are replaced by young ones the on average the overall talent level (and hence quality of opposition) increases. A lower quality league allows aging players to hang around longer. There are exceptions to this. In the early days of hockey, you didn't get paid too well as a player, so many still talented players left the league for higher paying careers keeping the average age down but decreasing the level of competition. Before the introduction of the entry draft (for example during wartime) really young players sometimes made the NHL, before they were good enough and this lowering of the average age reduces the quality of opposition. When pay went up in the mid 60's, even before expansion, the older players had better motivation to stay in shape and stay longer in the league and the average age increased without hurting the level of competition. The standard deviation of ages more or less scales with the average age, because few players have made the NHL at really young ages. A few made it before age 18, but this is not possible anymore under the current CBA. It hasn't been possible for decades. Increasing the standard deviation of ages essentially means you have more old players and runs into similar problems as the mean age as measurement of quality of opposition. Competitive balance is sometimes used as a proxy for quality of opposition, but it is imprecise as well. It is true that in the weakest years of the NHL, there were expansion teams who were really horrible. It is true that in the early years, there were often weak teams that were below the calibre of the rest of the league. However, we are now in the era of enforced parity. There are no more really good or bad teams. Does that make the quality of opposition any better? At best it is a shuffling of the opposition keeping it the same calibre. Having a bunch of .500 teams (assuming .500 means same number of wins as losses / it doesn't in the NHL) does not ensure a high quality of opposition. So, I planned to throw my hands up and say that it is an unsolved problem. But then I got a comment from Pnep (Roman Nepomnyaschev) in the how do we value WHA years sabermetrically? thread. He suggests using the percentage of players in the league that had the best season of their career in a given season as a proxy for calibre of opposition. In a lower calibre year, more players will have their best year of their career than in a higher calibre year. This is a good idea. It assumes a few things. It assumes we have knowledge of the player's full career. For example, if we only use NHL stats when the league first formed many players had the best year of their career a few years earlier, but will be counted that year because we do not have proper stats for their career best season. If we tried to calculate this value too quickly, we run into the problem of players who hade their best year so far, but might have a better one in the future. For example, how can we say if 2005/06 will be the best year of Miikka Kiprusoff or Jonathan Cheechoo or Sidney Crosby's career. It is the best so far, but that doesn't mean that they won't beat it someday, however, its possible they never will. As a method to calculate how good a season a player had we will use the hall of fame monitor Pnep has produced. In graphical form here is the percentage of players who had the best year of their career by season in the NHL. Here we see peaks during the beginning of the NHL - when there were player with unknown stats from leagues in previous years, then peaks during expansions, World War 2, a drop during the original six era and a rise during expansions and the WHA years with anther drop into more modern times. I think this is a relatively accurate showing of the calibre of opposition as a function of year in the NHL. It shows how tough it was during the original six heyday. It shows that it got worse during expansions and wartimes and it shows that the hockey today (a few years pre-lockout) had a very good calibre of opposition. Whenever a player I consider a future Hall of Famer (like Steve Yzerman retires I like to write up a piece to commemorate his career. One player I have kept around on my list of currently active players who are hall of famers regardless of what happens in the rest of their careers is Dave Andreychuk. He was waived last season by Tampa Bay and "sent to the minors" where he would get paid his NHL paycheque and not be required to report to the minor team. It was made clear at the time that he had not officially retired (I suppose this leaves open the possibility of trading his contract like that of Vladimir Malakhov). I have kept my eye open for any notice that Dave Andreychuk has officially filed retirement papers. For all intents and purposes he retired last season - but it wasn't official. This season, Dave Andreychuk is not playing, but I have found little about his official status. CBC reported that Dave Andreychuk retired officially to become a community representative with the Tampa bay Lightning. This was reported as far back as September 28th, but most of the mainstream press didn't even mention this story (I didn't see it on NHL.com, tsn, espn, cnnsi or slam sports). I think this shows the level of NHL media control. Its not a story that lends the NHL in a good light. A hall of fame player officially retires nearly a year after being waived and forgotten about as he has not reported to the minors. Its a very unsatisfying end to a player who was captain of the 2004 Tampa Bay Stanley Cup champions. However, since this was in the "old NHL" and it is in a forgotten small market this story seems to have been swept under the rug. Anyway, on to dave Andreychuk and his great career. Dave Andreychuk was born in Hamilton, Ontario on September 29th, 1963. He grew up in the Hamilton minor hockey system. In 1980, he joined the Oshawa Generals of the OHL. After two years, including a 100 point season, he was drafted in the first round 16th overall by Buffalo in the 1982 entry draft. In the 1982/83 season he began the year in Oshawa and scored 24 points in only 14 games and he starred for Canada in the World Junior championships. He made it to theNHL with Buffalo originally as an injury replacement (teams with sufficient iunjuries could call up players from junior in mid-season) and scored 37 points in 43 games in his partial rookie season. He remained with Buffalo for the rest of the 80's and into the early 90's. He consistently scored at around point per game rate and was an unmovable force that was hard to remove from the opponent's slot - especially on the power play. In 1986, he was a member of the Canadian team at the World Championships. Andreychuk was one of the best players in hockey that nobody noticed, since he was hidden in small market Buffalo and he was a consistently very good scorer but he never had that great season. In 1990, he finally made his first NHL all star game. This was in a season where he scored 82 points in 73 games (which were relatively typical numbers for Andreychuk at that time). In 1993 he was traded to Toronto with Darren Puppa and a first round pick (who was used on Kenny Jonsson) for Grant Fuhr and a fifth round pick (used on Kevin Popp). This season was a 54 goal season and 99 point year which were both career highs for Andreychuk. He immediately clicked well with Doug Gilmour. Andreychuk was the first player ever to be traded during a 50 goal season. He followed this up with a 53 goal, 99 point season that saw his second (and final) All Star game appearance of his career. By 1996, the rebuilding Maple Leafs traded Andreychuk to New Jersey for a second round (used on Marek Posmyk) and a third round pick (used on Andre Lakos). In New Jersey, Andreychuk was used by the defensively coached Devils mostly in offensive situations. In this more limited usage, Andreychuk stopped scoring at point per game rate for the first time in his now 14 or 15 year NHL career. In 1999, Andreychuk signed as a free agent in Boston. He only lasted part of a season before being traded to Colorado along with Ray Bourque for Brian Rolston, Martin Grenier, Sami Pahlsson and a first round pick used for Martin Samuelsson. In 2000, Andreychuk returned to Buffalo as a free agent. He stayed for one 20 goal season. He left as a free agent to Tampa Bay. In Tampa, he was named captain and had a resurgence in his playing time. In 2004, he captained the Lightning to the Stanley Cup. After losing a year to the lockout, Andreychuk found himself unceremoniously waived in mid-season. This was a horrible way to end a great career. The NHL wants to sweep this under the rug instead of celebrate his retirement and that is unfortunate. Dave Andreychuk retires with 270 career power play goals. This is a career record. He has the fourth most career games played in NHL history with 1639 and the eleventh most goals in a career with 640. Andreychuk was a very consistent scorer for a long period of time. He was one of the most dominant power play players ever. He played the "power forward" position before the term was fully coined as a powerhouse who was impossible to move from the slot who finished all the scoring chances created for him. He never had the high penalty minute total that typically goes with a "power forward" - he only once topped the 100 PIM mark in his career. He was a good team player and a talented leader who led a team to the Stanley Cup, but is often overlooked because he lacked a truly great season and spent most of his career away from the NHL's big markets. Andreychuk's retirement has been unceremonious. If there is some more ceremony in the future, I may readdress this point, but so far it looks like the NHL is embarrassed by the way his career has ended and wants this swept under the rug. The Pittsburgh Penguins have a new agreement in place for a new owner. Jim Balsillie of Peterborough, Ontario and owner of Research in Motion (who make Blackberrys) has agreed in principle to buy the team for $175 million. This is the second person who has agreed in principle to buy the team. In July, Howard Fingold reached an agreement that fell apart. The sale price was approximately the same. Balsillie claims he wants to keep the Penguins in Pittsburgh, although there has long been speculation that they might be moved (for example to Kansas City). Since Balsillie is Canadian speculation about moving a team to Hamilton or other points in southern Ontario exists. The problem with Pittsburgh is not the fanbase, it is quite strong. The problem is a lack of an arena. Mellon Arena is the oldest in the NHL and has not been kept up well. There have been attempts, which have been largely unsuccessful to get local politicians to build a new arena. Pittsburgh is a strong hockey market. If an owner steps up and builds a new arena (I have no idea if that is in the plans) it should remain a great place for hockey. The owners reap the benefits from the arena existing, and have built NHL arenas in the past, its not the job of local taxpayers to finance the NHL by building them arenas. Here is the TSN story on the potential sale. Over the course of the summer many pundits suggested the Devils would have to be broken up to meet the salary cap, it appears this isn't so. The Devils found themselves well above the cap this summer with key free agents (Paul Martin and Brian Gionta) yet to sign. This was due to some poor contracts handed out in the summer of 2005 to Alexander Mogilny and Vladimir Malakhov. Neither is expected to play this year but because they are both players who were over 35 when they signed their contracts, both their contracts were expected to count against the salary cap. Malakhov is all but retired. He says he is retired, he hasn't played since the middle of last season, but he hasn't filed his retirement papers with the NHL. Mogilny hasn't played in the NHL since the middle of last season either when the Devils sent him to the minors. Due to a degenerative hip condition it is doubtful that he will ever play again. Lou Lamoreillo got himself out of trouble by trading Vladimir Malakhov (and his contract) to San Jose. San Jose expects that they will not use all of their salary cap room this season, so they can afford to sell it off. They received the Devils 2007 1st round draft pick in return (conditions are attached, but likely they will get it) in return for spare part defenceman Jim Fahey and Alexander Korolyuk (who is playing in Russia). Its a nothing much of substance for taking Malakhov's salary off the books in return for a 1st round pick. The Devils have also had an independent medical examination of Mogilny show that he is suffering from a long term injury and thus can have his salary not count against the cap. Ironically, if Mogilny had retired or even died his salary would count against the cap according to the CBA - it is only because he has a longterm injury that it doesn't. This is one problem with a dramatic change to the rules in the CBA, loopholes can create unintended consequences in places where it would not have mattered in the old CBA. The Devils have had Paul Martin, Brian Gionta and David Hale all participating in their training camp despite the fact they were unsigned - which has prompted some to wonder if they have agreed to contracts that would be filed with the league as soon as the Devils cleared cap space. Some others complain that Lamoreillo's moves show favoritism toward him from the league. If he was a GM of lesser renown maybe they wouldn't be allowed. I think the biggest problem is a needlessly complex CBA that makes big issues about stupid stuff like this instead of what is happening on the ice. Here is TSN's story about the Malakhov traded and here is the story about Mogilny. In its history, the NHLPA has rarely been as fractured as it is post-lockout. Trent Klatt led a group of unhappy players to challenge the way Ted Saskin was brought in to end the lockout. They argue that it violated the NHLPA constitution the way Bob Goodenow was replaced without a majority vote among membership. Ted Saskin then negotiated a pro-owner lockout settlement that has many players unhappy. While Ted Saskin has spent a large amount of time trying to maintain his job and consolidating power hoping that the unhappy players would just retire and leave him alone. This isn't happening. They unsuccessfully challenged this issue with the American Labor Relations Board and just when it looked like they would go away, they are back. This group of players (including Chris Chelios and Dwayne Roloson) are suing Ted Saskin, Trevor Linden, Bill Guerin, Bob Boughner and Vincent Damphousse - all members of the executive committee that ousted Goodenow and installed Saskin for damages relating to the results of the NHLPA not following its own constitution. At issue is the lockout settlement. These players are unhappy with losing a year to eventually cave to the owners and want some kind of ruling or compensation to acknowledge that it was wrong. What can actually be done? I'm not sure this court case has much standing, but it is another headache for Ted Saskin. Another reason to prevent him from consolidating power. Another reason for change in the NHLPA. The NHLPA has been nearly useless to the players. Its biggest "victory" of the past year is a REDUCTION in the salary cap this season. Some players are wondering why the NHLPA exists and if the would be better off without it. Likely this lawsuit wont lead to anything tangible, but there is always a chance we will be surprised. A big enough suprise could change the business of hockey tremendously. Here is TSN's story on the lawsuit.